ESPN Wide World of Sports Complex, Kissimmee, Fl. — Disney owns everything it seems, but the Boston Wolfpack owns Disney – at least the part of it where the MSBL Holiday Classic is concerned. Behind the strong pitching of starter Jim Kearschner, an MVP performance from reliever Edgardo Mercado, and a four hits form German Rivera, the Wolfpack defeated a tough, Jacksonville Vikings squad 4-2 to claim the 45-and-over crown. It was the Wolfpack’s eighth Disney crown in 13 straight appearances at the Holiday Classic, and their sixth in a row. The team also won titles 2003 with a 9-5 win over the Jacksonville Vikings, and in 2001 with a 14-7 win over the Charlestown Yankees. They have been runners-up at the tournament four times including a loss to the Vikings in 2004 38-and-over finals. The finals on Martin Luther King Day (Jan. 21) got started after a one hour rain delay, and early on it looked like the Vikings might have the upper hand. They opened the game with three straight bunts and ended up scoring twice in the first. The Pack tied the game in the third on hits by Mercado, Glen Burns, and Miguel Franquiz. The Pack took the lead in the sixth when Franquiz walked, moved to second on Russ Ward’s sacrifice bunt, and scored on Rivera’s double. They added an unearned run in the seventh inning on Mercado’s clutch, two-out single. Mercado got it done on the mound too. He entered for Kearschner in the seventh and allowed no runs on just two hits the rest of the way to earn the save. 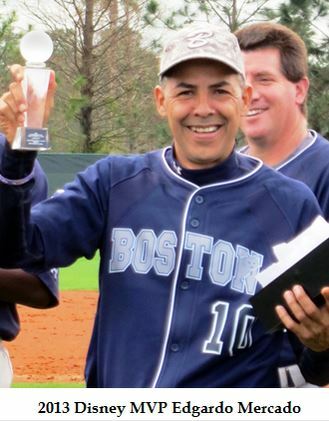 Mercado also notched a complete-game win in the tournament opener against the Birmingham Yankees – last years’ runners-up. The Pack was 4-0 entering the playoffs. They played an extra round robin game in order to help balance the schedule in the seven team division. For the second year in a row they beat the San Antonio Reds in the semifinal game – this time by a score of 10-1. Dave Benedict got the win with six innings pitched in relief of Kearschner. Doug Flutie, who led the team with 13 hits and 10-runs scored on the weekend, was 3-for-4 in that game. Franquiz’ three-run triple in the second inning broke it open. Benedict and Dean Borelli knocked back-to-back two-run doubles in the seventh inning to ice it. Brett Hixon, who threw a complete game earlier in the tournament, pitched well but took the championship game loss for the Vikings. “Brett did a great job and kept us in the game,” said manager Louis Hancock. Hixon was the Vikings’ tournament MVP. He threw 17 innings on the weekend and was one of seven Vikings to hit over .300. Other standouts included Rick Scheetz who went 10-17 (.588 avg.) over five games. Rick Walker went 6-13 (.461 avg.) and Mike Flaskey went 8-20 (.400 avg.) Walker and Flaskey also turned in defensive gems in the championship game.